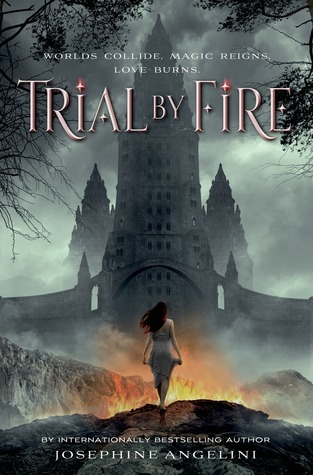 I have heard about Trial By Fire from some of my best blogging friends ever since it came out two years ago. Although I had purchased the book last year, it was still sitting on my shelf collecting dust. It just never spoke to me, but still sounded interesting enough to buy just in case the mood struck. When it came up as available as an audiobook from my library, I knew it was the perfect opportunity to finally give it a try! Trial By Fire is about Lily, a girl who is allergic to everything and her life is pretty limited as a result. She wants to go to a party for the first time, it turns out horribly wrong, and she... ends up in a parallel world full of witches and monsters. There, she meets Lillian, her alternate universe double, who also happens to be the strongest witch Crucible in this version of Salem and wants Lily to join her in her schemes. Obviously, because Lily is the heroine of this story, she decides to do the opposite. I actually didn't have many feelings about Lily. She was an okay main character, I suppose, but she just didn't wow me like I hoped she would. I could certainly understand why she wanted to get away from Lillian, why she wanted to help where she could, and why she struggled with going back home. It wasn't that I couldn't understand her motivations, there was just something about her that didn't really click for me and I can't quite put my finger on it. I also didn't quite buy the romance. The two love interests (because there must be two) are Rowan and Tristan. Rowan actually chases Lily down and tries to kill her upon their first meeting, but quickly redeems himself. There is actually a Tristan in Lily's own Salem, but he is a cheating scum bag so she has issues trusting this Tristan to begin with, but begins to realize they are not the same person. The three of them go on the run together and Lily has to work out her feelings for each of them. I didn't hate either of the love interests, but again I just didn't really connect with either of them. To be honest, I didn't really connect with this book. Trial By Fire tries to be a lot of things. When I picked it up, I assumed it was fantasy, obviously with parallel universes as well. Those two things could probably work together alright, but throw in a ridiculous amount of science-y stuff and giant man-eating monsters and... it's just too much. Essentially, science is outlawed and the world runs on magic. I understand the point. Again, the problem with the book isn't that I didn't understand, it's just that I never really cared - I wasn't invested. And on to something I never quite did understand - Lily's magic. It's repeated over and over that magic is something learned over years, so I cannot, for the life of me, understand why Lily basically just walked into Salem and dominated everything. I also couldn't understand why a lot of the magical elements in this story worked the way they did, especially the weird mind connection thing. In the case of the magic, I do wish things had been explained a bit more. The world building was well done, I'll give it that! I had a great time picturing this alternate Salem with its differences from our world. I loved how the differences were explained to make me feel like they actually made sense instead of just being ridiculous. The gardens were especially interesting to think about. Unfortunately, an interesting world doesn't make a great book. I wanted so much more from this book! I have heard endless great things about this entire series and, although I had never read anything by this author, I expected to be blown away. Trial By Fire just wasn't what I'd hoped. I never really connected with any of the characters and the plot was confusing and scattered. I don't think I'll be picking up the next one in this series.